Welcome to the Freeola Support pages. This guide is designed to take you though the basic steps for changing your DNS server setting within Mac OS X. For more internet help topics please visit our main Support Page. 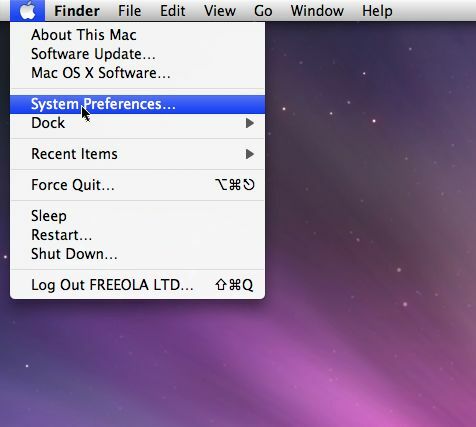 Firstly select the Apple Icon in the top left of your screen and select and select System Preferences. This will take you to the System Preferences screen where you are given access to many of configuration options within Mac OS X. 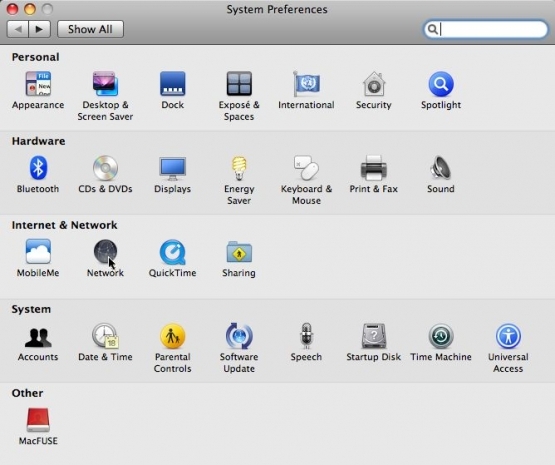 From the System Preferences screen you will need to click on Network, this will take you to the Network Configuration screen. Within the Network Configuration screen you will need to first Ensure the Connection that is used to connect to your router is Highlighted on the left. You should then Enter your DNS server into the box labelled DNS Server. For OpenDNS this is 208.67.222.222 or 208.67.220.220. Alternatively if you are not using OpenDNS, Freeola's DNS server is 195.74.113.58 or 195.74.113.62. If you then select Apply, this change should take effect immediately. In order to ensure your new DNS setting is working correctly, you should attempt to bring up a web page, for example http://freeola.com.